Inflammation of a lymph node or of a gland. /ad·e·ni·tis/ (ad″ĕ-ni´tis) inflammation of a gland. Bartholin adenitis inflammation of the greater vestibular gland (Bartholin's gland) resulting from acute infection of the gland. cervical adenitis a condition characterized by enlarged, inflamed, and tender lymph nodes of the neck; seen in certain infectious diseases of children, such as acute throat infections. mesenteric adenitis see under lymphadenitis. vestibular adenitis chronic inflammation of the lesser vestibular glands, producing small, extremely painful ulcerations of the vestibular mucosa. an inflammation of a lymph node. Acute adenitis of the cervical lymph nodes may accompany a sore throat and stiff neck, simulating mumps if severe. It is most often related to an oral, a pharyngeal, or an ear infection. Scarlet fever may cause acute suppurative cervical adenitis. Swelling of the lymph nodes in the back of the neck is often the result of a scalp infection, insect bite, or infestation by head lice. Inflammation of the lymph nodes of the mesenteric portion of the peritoneum often produces pain and other symptoms similar to those of appendicitis, but characteristically mesenteric adenitis is preceded by respiratory infection, the pain is less localized and less constant than in appendicitis, and the pain does not increase in severity. Generalized adenitis is a secondary symptom of syphilis. Therapy requires treatment of the primary infection by the administration of antimicrobial agents, application of warm compresses, and when fluctuation is present, incision and drainage. Also called lymphadenitis. Compare acinitis. Inflammation of a gland. The term is not commonly used as a “stand-alone”, but rather as part of a larger word or with other root forms, as in lymphadenitis—the formal term for inflammation of a lymph node. Inflammation of a LYMPH NODE or any GLAND. The usage, lymphadenitis, reflects the persistence of the effect of the earlier erroneous belief that lymph nodes were glands. n an inflammation of glandular tissue, often accompanied by pain. granulomatous inflammation of the lymph nodes of the neck in pigs; asymptomatic and found only at slaughter; caused by Rhodococcus equi or atypical mycobacteria, rarely by Mycobacterium tuberculosis, M. avium, M. bovis. 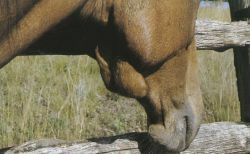 equi podria favorecer la permanencia de la bacteria en nasofaringe y bolsas guturales en los caballos portadores de adenitis equina, por aumentar la adherencia de la bacteria al epitelio y por la accion protectora de la matriz extracelular. Analysis of the genetic basis of periodic fever with aphthous stomatitis, pharyngitis, and cervical adenitis (PFAPA) syndrome. Sebaceous adenitis (SA) is a rare idiopathic skin disease occurring in canines. Colchicine prophylaxis for frequent periodic fever, aphthous stomatitis, pharyngitis and adenitis episodes. 2) In the CHER cohort, 19% of children with BCG IRIS adenitis also had TB IRIS. Two siblings with periodic fever, aphthous stomatitis, pharyngitis, adenitis (PFAPA syndrome). Early detection and treatment of vesicular adenitis in bulls. Dr Ian Willetts performed the surgery, and he told the coroner's court how he discovered during the operation that Paige had inflamed lymph nodes, called mesenteric adenitis, which indicated she had an infection. Dr Ian Willetts, who performed the surgery, said he discovered during the operation Paige had inflamed lymph nodes, called mes senteric adenitis, which indicated she had an infection. post influenzal cervical adenitis with pressure on left brachial plexus causing neuritis in left arm . Various alternate diagnoses can be suggested by CT scanning; these include: mesenteric adenitis, epiploic appendagitis, diverticulitis, Crohn's disease and caecal carcinoma. But it turned out to be something called Sebaceous Adenitis, which is more commonly seen in poodles.